Allison Sarnoff Soffer writes and teaches in Washington, DC. She especially enjoys writing for and about children. Apple Days is her first book. Allison worked as a program officer at the National Endowment for the Arts, and has published in Scholastic News, The Washington Post, and Who Cares Magazine. She was an active stay-at-home mom for eleven years before deciding to become a teacher - a life-long goal. In the classroom, Allison is deeply influenced by the Reggio Emilia approach to education. 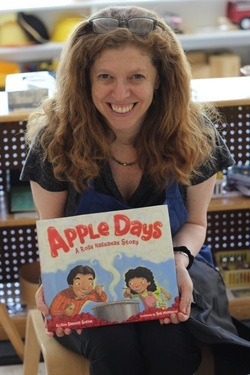 Music, literature, and the arts are central to her work with young children. Allison grew up in the New York area where she studied at American Ballet Theatre and performed children’s roles in area productions, most notably as Clara in the Nutcracker Suite, at the Brooklyn Academy of Music and at Nassau Coliseum. Allison attended Princeton and Columbia Universities (BA) and studied journalism at Northwestern University (MSJ). She lives in Chevy Chase, MD with her husband, Bob, and their two children, Caroline and Benjamin.